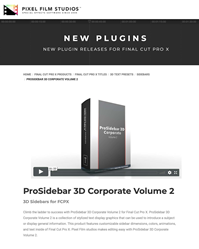 Developers at Pixel Film Studios Launch ProSidebar 3D Corporate Volume 2 for Final Cut Pro X.
Pixel Film Studios, leading developer of visual effect tools for the post-production and broadcast markets, announces the availability of ProSidebar 3D Corporate Volume 2 enabling film editors to incorporate stylized 3D corporate sidebars to Final Cut Pro X projects. "ProSidebar 3D Corporate Volume 2 is the next iteration of spectacular three-dimensional corporate sidebars created exclusively for Final Cut Pro X." Climb the ladder to success with ProSidebar 3D Corporate Volume 2 for Final Cut Pro X. ProSidebar 3D Corporate Volume 2 is a collection of stylized text display graphics that can be used to introduce a subject or display general information. This product features customizable sidebar dimensions, colors, animations, and text inside of Final Cut Pro X. Pixel Film Studios makes editing easy with ProSidebar 3D Corporate Volume 2. ProSidebar 3D Corporate Volume 2 features 9 professional sidebars created for Final Cut Pro X. Each sidebar is uniquely designed so that users have a wide variety of styles to choose from. ProSidebar 3D Corporate Volume 2 is completely customizable and can be applied to any production in Final Cut Pro X.
ProSidebar 3D can be used in a variety of ways. Use ProSidebar 3D to present any subject. Introduce people, locations, features, and events. The possibilities are endless. ProSidebar 3D can also be used to display lists, rankings, schedules, recipes and general information in Final Cut Pro X. Using ProSidebar 3D is incredibly easy. Just find a preset from the Titles Browser in Final Cut Pro X. Then, drag and drop it onto media in the timeline. ProSidebar 3D is ready-to-use with controls in the Inspector window.